Pre-requisites: Candidates must hold a Certificate of Competence for Chainsaw Maintenance & Cross-Cutting (CS30 / 0020-03,) Felling Trees up to 380mm (CS31 / 0020-04) & Basic Tree Climbing & Aerial Rescue (CS38 / 0020-13) prior to attending this course. Learners must be physically fit and not suffering from vertigo or similar conditions or on medication that could affect your safety. 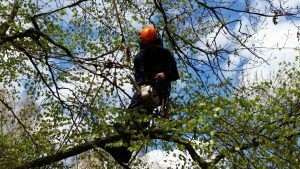 This course culminates in an independent assessment for a City & Guilds Level 3 Award in Aerial Cutting of Trees with a Chainsaw using Free-fall Techniques.